London, Victoria & Albert Museum, from 21 March to 22 June 2008. 8 Then New York, The Bard Graduate Center for Studies in the Decorative Arts, Design and Culture from 17 July to 16 November 2008. It seems that only the English know how to look at and exhibit decorative arts as a living matter, reflecting its strong hold over those who have made them an everyday companion in their lives or the instruments of an aesthetic crusade. Rejecting aseptisized whites and grays, Londoners dare to splash color on their walls, to regroup objects in assymetrical and hybrid ways, to break spatial barriers ; nor do they flinch at theatrical and lighting effects to breathe life into a marble statue by Flaxman, Canova, Thorvaldsen or just to draw attention to a painting. Accompanied by a well-chosen text, the Thomas Hope exhibition develops a precise and objective biography of the artist in just a few rooms. The progressive staging adopted by the organizers, in a welcome refinement for its search of surroundings suited to the explanations, avoids solidifying, congealing, in a word embalming the paintings, sculptures, furniture, albums and ceramics. Like black and orange, blue and gold, the old and the modern go well together here. Around 1800, both in Paris and London, the reverence for Antiquity and the brilliance of youth went hand in hand. Why should it be any different today ? The exhibition at the V & A is in no way a dusty catalogue of faded relics. Forty years after David Watkin’s book in 1968, eminent specialists revisit along with him the fascinating figure of Hope (ill.), whose international culture is more relevant than ever. Born in 1769 in Amsterdam to a prosperous family of bankers, the future pope of Regency design undertook his Grand Tour between 1787 and 1795, combining traditional Italy and Portugal on the one hand and the Balkans on the other ; in 1792, in Rome, Jacques Henri Sablet shows him playing cricket in his portrait, simply marvelous. His exotic inclination and his encyclopedic inquisitiveness push him in 1796-1798 all the way to Constantinople. The Egyptian model will be the second element behind his open-minded reflections on ornamentation, colour and the formal vocabulary of new taste. The arrival of the French Republican army in the Low Countries in January 1795 forces his family into exile in England. A few years later, in the last step of his London launching, Thomas moved into Duchess Street after acquiring a spacious home designed and decorated by Robert Adam. A beautiful residence, it had belonged to William Hamilton’s sister (in 1801 he bought a large part of the second collection of Greek vases from William) and he undertook a major remodeling, enlarging and redecorating it. Notably, he added several galleries where first-rate paintings (Guercino, Poussin, etc. ), sculpture and antiques were gracefully lined up in a didactic endeavor that was nonetheless devoid of puritanical dullness. Because the collector never forgot to be the arbiter of taste and the master of elegance that he strived to embody at any price. A patron of Flaxman’s engravings, Hope was struck by the amazing beauty and the novelty of Percier and Fontaine’s publications. The two Parisian architects (they would sometimes cross the Channel) began to publish their Recueil de décorations intérieures in 1801, a formula that Thomas Hope would adapt to the London environment. Six years later his own illustrated manual appeared, Household Furniture and Interior Decoration, veritable bible of Regency taste. He himself crossed the Channel as soon as hostilities died down, in 1802-1803 during the truce initiated by the reaty of Amiens, in 1814 after Napoleon’s first fall. Never in one place for long, always involved in a project, Hope published on any subject where he felt an aesthetic reform was needed, from gardening to how to dress or how to behave in society : a true art of life that his wife, the beautiful Louisa, applied and which the exhibition illustrates delightfully. There are also the major modern sculptures that he commissioned for his enjoyment and that of the many visitors he welcomed to his home. Canova’s Venus is here from Leeds, the group of Aurora and Cephalus by Flaxman from Liverpool and Thorvaldsen’s Psyche from Copenhaguen. Obviously, modern painting held its own next to these amorous mythological figures. 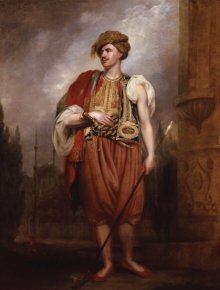 Hope was one of West’s and Westall’s patrons, as well as of several French artists, including Antoine Dubost – his Damocles from the Salon de 1804 resurfaced recently – and Louis Gauffier, two of whose paintings he owned, from the museum in Poitiers. Every piece of the puzzle is in place here, and has its share to tell, inviting the museum goer to put together a fitting portrait of this artist without borders. David Watkin et Philip Hewat-Jaboor (ed. ), Thomas Hope, Regency Designer, Yale University Press, 2008, 528 p. £50. ISBN : 978-0-300-12416-3.